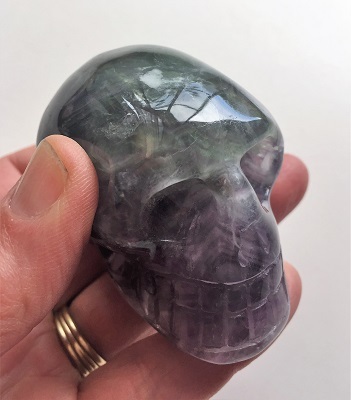 Rainbow Fluorite Crystal Skull carving with a beautiful colorful blend of dark purple, blues, greens and white. Fluorite is a wonderful crystal tool for cleansing, purifying, and reorganizes anything within the body that is not in perfect order. Fluorite is a highly protective stone, especially on the psychic level. Fluorite cleanses and stabilizes the aura as it draws off negative energies and stress of all kinds. Fluorite grounds and integrates spiritual energies and heightens intuitive powers. Fluorite may also help to dissolve illusions and reveal the truth. Fluorite is helpful for the absorption of new information and promotes quick thinking. In healing, Fluorite is a powerful healing tool, dealing with infections and disorders. 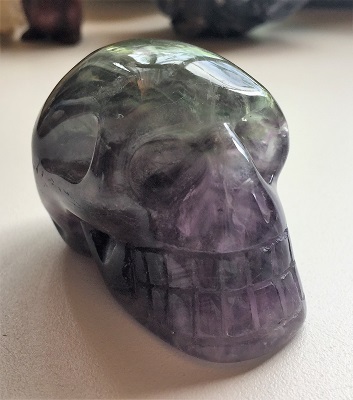 Fluorite benefits teeth, cells and bones, and repairs DNA damage. 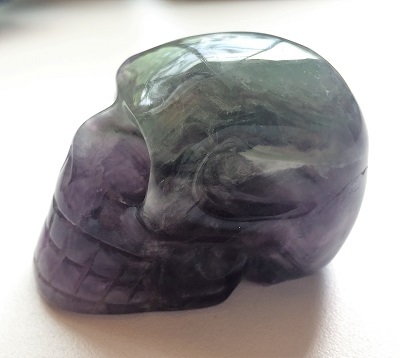 Helpful in dissolving adhesion and mobilizing joints, Fluorite alleviates arthritis, rheumatism, and spinal injuries. 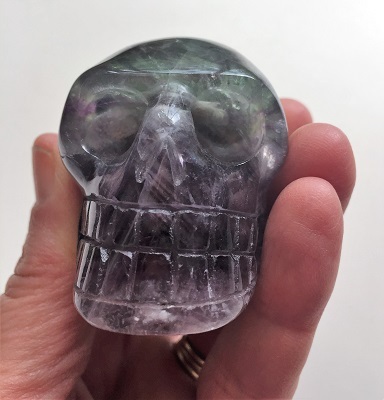 Fluorite provides pain relief, ameliorates the discomfort of shingles and other nerve-related pain, and heals the skin, removing blemishes and wrinkles and may be supportive during dental work. Fluorite rekindles sexual libido.